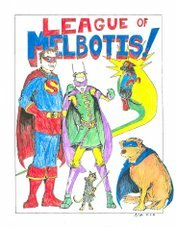 League of Melbotis: Superman Inspired Goodness? It seems that JLA and Identity Crisis writer Brad Meltzer has started the ball rolling on a great, multi-pronged project. He's involved with an organization called "Ordinary People Change the World", which invites people from all walks of life to engage in civic responsibility and help others. Meltzer has started a group, or sub-group, called "The Siegel and Shuster Society" which is working to raise funds toward the preservation of the home Jerry Siegel lived in through his twenties, and where he was living when he developed the idea for Superman. Read more here. I think its worth noting that Meltzer hasn't just focused on the preservation of the Siegel home, but has hitched the Siegel and Shuster Society to the greater effort of Ordinary People Change the World, encouraging folks to find other ways in which they can help their community. Meltzer had teamed with a number of comic professionals to obtain items for bid whose proceeds will benefit the Siegel and Shuster Society, and begin restoration of the century-old home in Cleveland. The items are all, invariably, awesome. Which means I can't actually afford any of them, but you can also just donate, or purchase a shirt from the Society (which will also help out). Keep in mind, they aren't trying to make a museum out of the house (yet). They're trying to get the house into better shape for the couple who actually lives in the house every day. Figure out a way in which you can participate. Well, I wouldn't put it at the top of my list of most important charitable causes, but it's a cool idea, nonetheless. You know, I knew I was going to have to frame how I put this whole thing a certain way or you were going to bag on it.